Situated on the promenade overlooking the Mykonos Town harbour, Kazarma stays open practically year-round, sometimes closing only for about 15 days during the Christmas season. 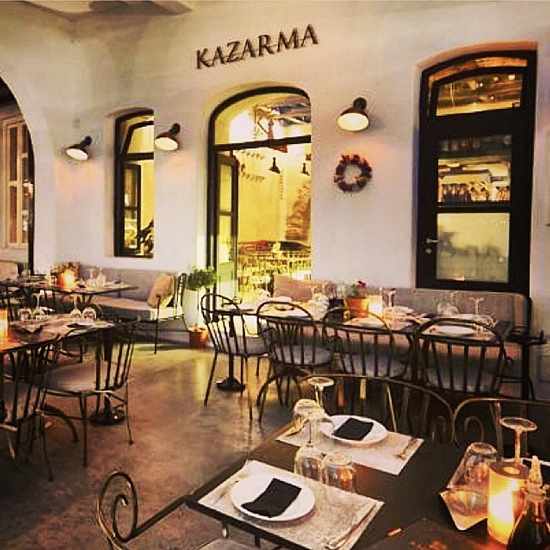 This photo of the restaurant’s patio is from the Kazarma page on Instagram. Visitors can enjoy fab views of Mykonos Town, the Old Port and the sunset all year long at Blu Blu Lounge. 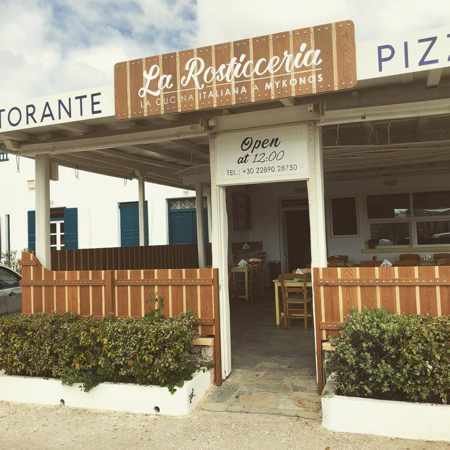 Situated next door to Roca Cookery and the Mykonos Archaeological Museum, Blu Blu has an outdoor terrace and three indoor levels, where customers can access an Internet lounge or watch major international sports events on a cinema-size projection screen. Blu Blu serves breakfast, lunch and dinner, coffee, juices, snacks, drinks and cocktails. 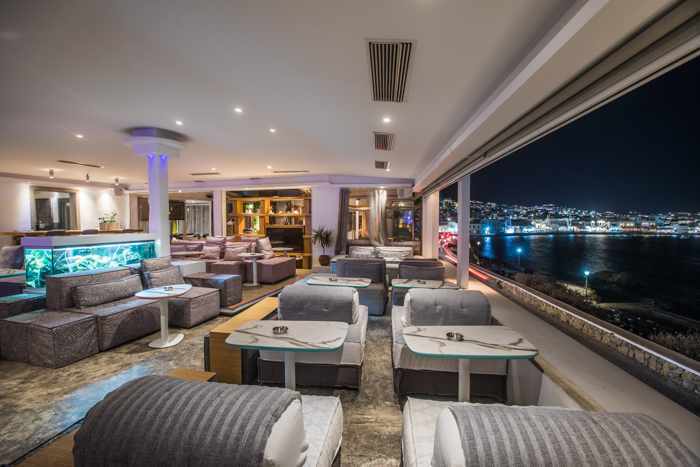 Part of a sea- and town-view lounge space is seen above, in a photo from the Blu Blu Lounge page on Facebook. 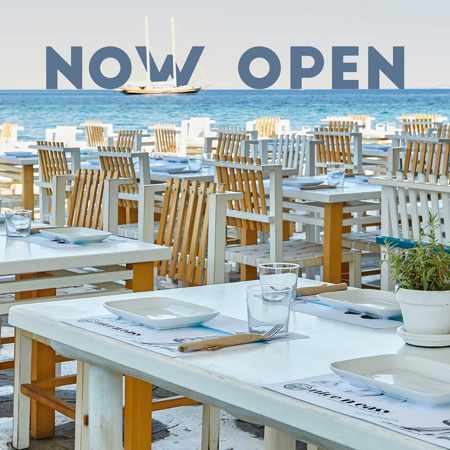 Captain’s, a popular mezedopoleio and kafenion on the Mykonos Town harbourfront, is open almost all year — from February 1 to November 30. Its hours of operation are 7 a.m. to 11 p.m. , while from May to September, it extends its hours until 1 a.m. Captain’s is closed only during December and January. This streetview photo appears in a gallery on the Captain’s restaurant review listing on TripAdvisor. Appaloosa Restaurant and Bar started its 2019 season in mid February, opening Wednesdays through Sundays. 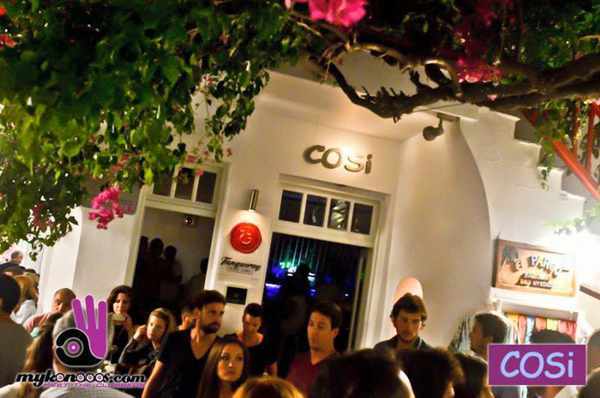 It extends its hours of operation to seven days per week closer to the main tourist season. The restaurant’s interior is shown in this image from the Appaloose page on Facebook. 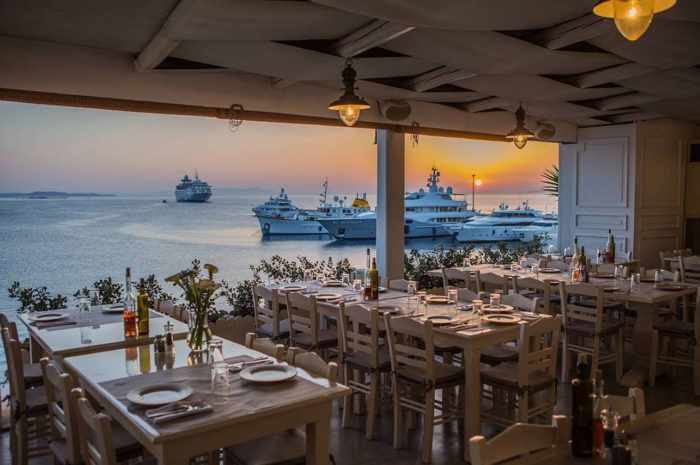 Visitors have been able to enjoy dinners with sunset views of the Mykonos harbour and Old Port at Roca Cookery (a.k.a. Roca Veranda) since March 1, when the restaurant began opening three days a week: Fridays and Saturdays at 5 p.m., and Sundays at noon. It will extend its days of operation later in the spring. This image is from Roca’s page on Facebook. Roca Cookery opened a new fast food restaurant, Pita Wrap & Pizza, last September, and it has been serving takeout and delivery orders throughout the winter. This photo from the Pita Wrap & Pizza Facebook page shows a street view of its premises on the ground floor of the Roca Cookery building. The Mykonos Archaeological Museum is right next door — partially visible behind the big palm tree on the right side of the picture. 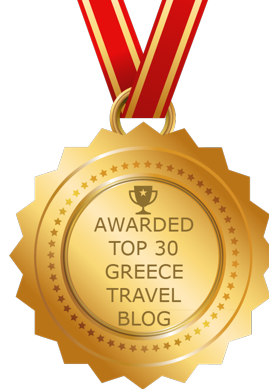 Also open throughout the year is Obati, which is situated in the Glastros district of Mykonos. 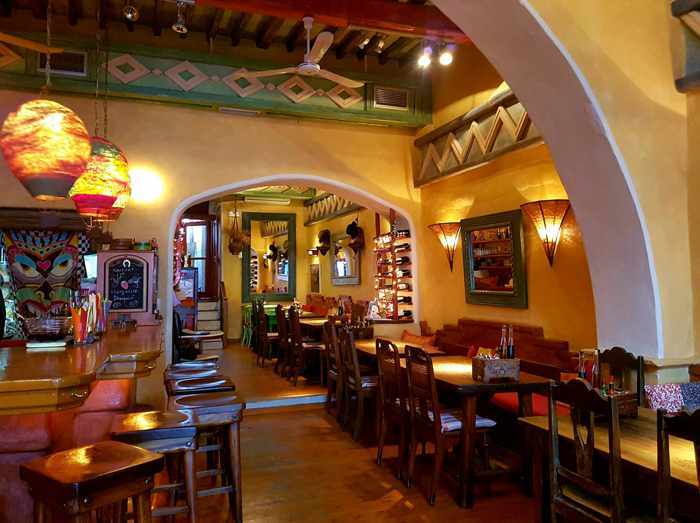 Obati describes itself as an “all-day cafe bar restaurant that combines Italian flavors in the Mediterranean cuisine,” and is seen here in a streetview photo from the Obati page on Facebook. 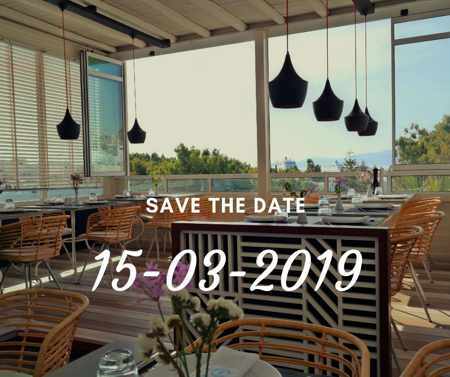 Vegera restaurant and bar toasted the start of its 2019 season on March 8, opening from 7 p.m. until late at night. 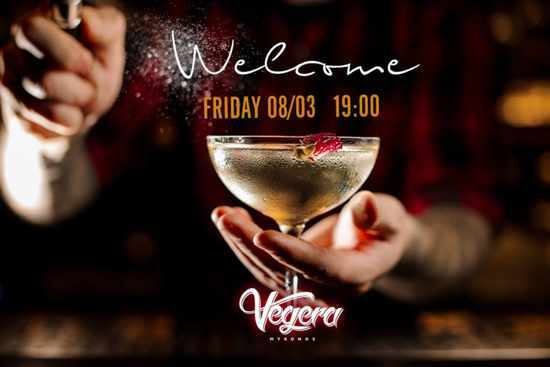 On weekend nights, Vegera hosts special party events. 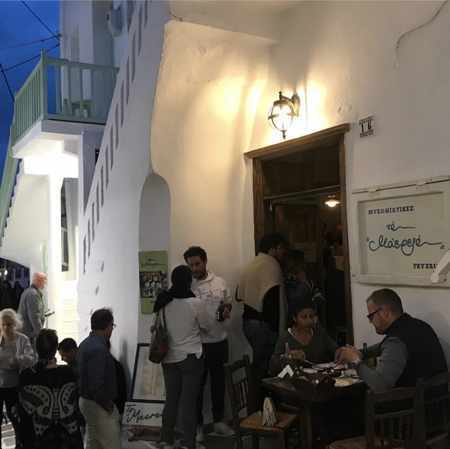 Friday March 22 was the official opening day for the most popular restaurant at the Little Venice seafront of Mykonos Town, nice n easy. 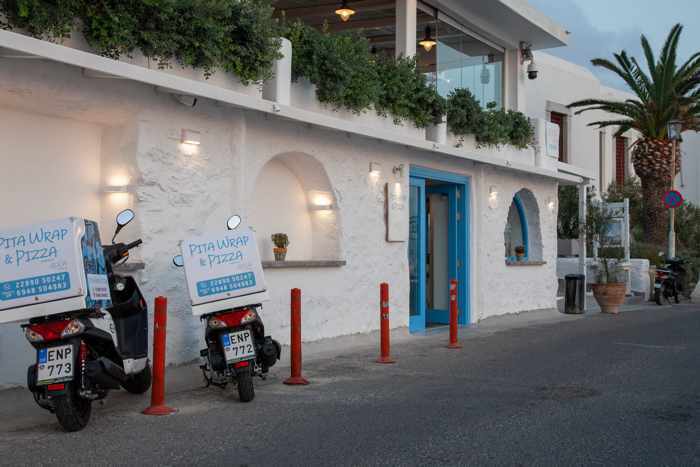 Also opening on March 23 was the new Souvlaki Story Taverna in the Argyraina district of Mykonos. 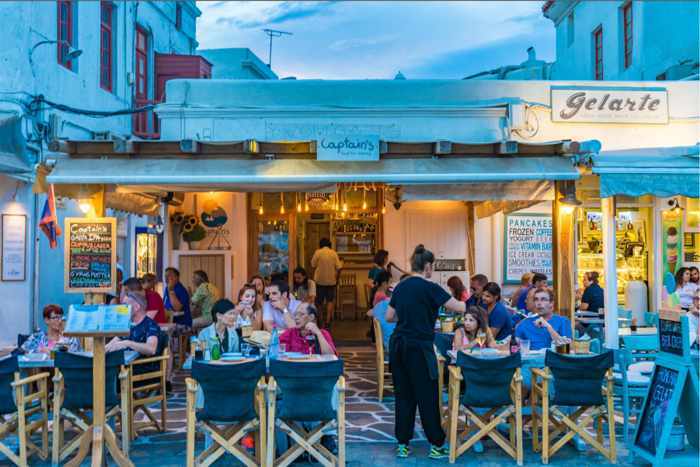 A traditional Greek “concept” restaurant, it’s one of five Souvlaki Story outlets on Mykonos. Fabrica Food Mall also held its season opening on Saturday March 23. 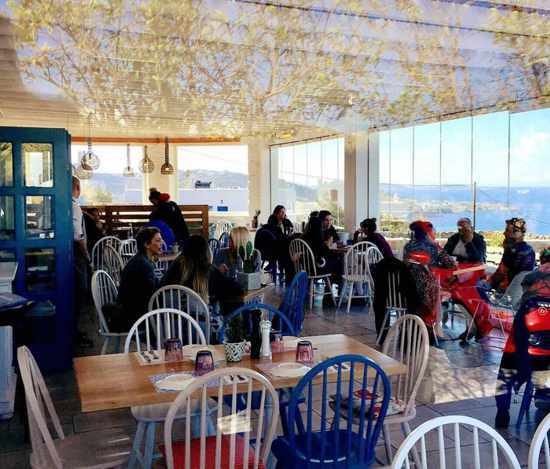 It features six different eateries under one roof, offering one-stop, all-day dining — breakfast, brunch, lunch, dinner and dessert. 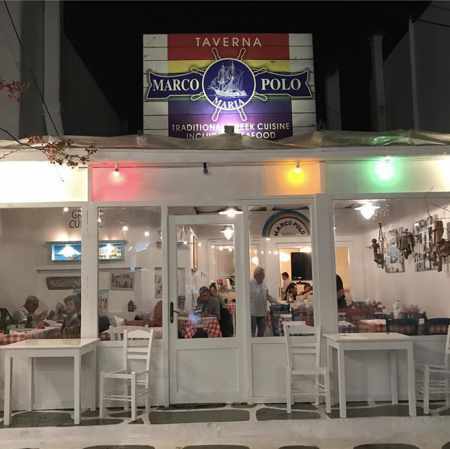 Yet another March 23 opening took place at the family-operated Marco Polo Taverna, which has been serving traditional Greek cuisine at its location in the Lakka district of Mykonos Town since it was established by Markos and Maria Kontizas in 1967. The taverna is open from 12 noon until around 11:30 pm or midnight during the spring. This streetview photo of the taverna was shared by Instagram member davidsalomonr. 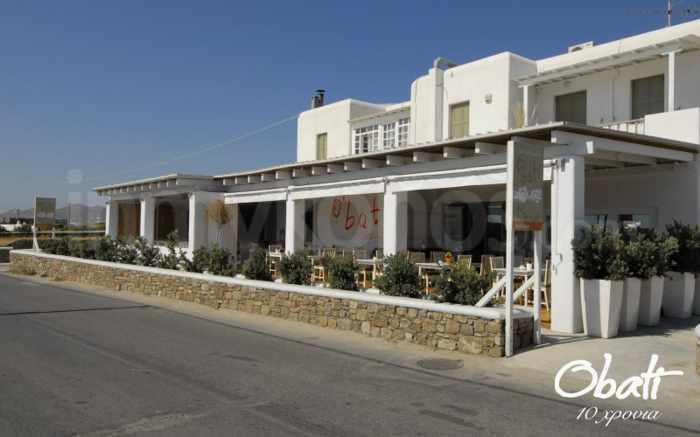 One of my favourite places to eat in Mykonos Town, Το μαερειό Εστιατοριο (To Maereio), will be back serving delicious home-made Mykonian specialties and Greek cuisine on March 27. This streetview photo of To Maereio is from its Instagram feed. 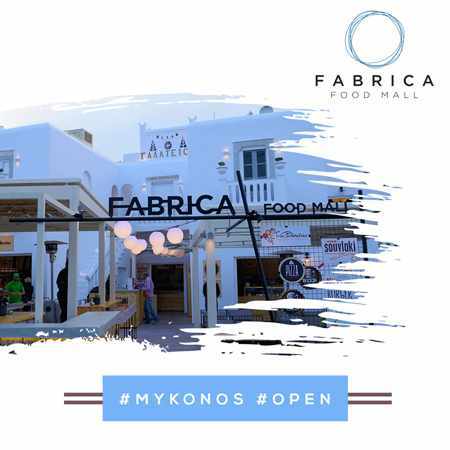 Related article: Mykonos bar & beach club openings for 2019.